This Lenten season seems an appropriate time to return to my I Believe posts about Why I Believe God Exists. The last time I wrote one, I shared about how Suffering actually Proves God exists, contrary to what many say. Today, I’m thinking on the opposite end of the spectrum about how Goodness and Kindness prove God exists. This weekend, our family decided to do something totally crazy and go out to eat with all the kids to a nice restaurant. We had just been to confession so maybe we were a tad tipsy on Grace to think that was a good idea. But we were determined so we went and decided to make the best of it. Much to our happy surprise, everyone behaved fairly decently! We didn’t have to continuously drag anyone off the sticky floor and out from under the table. The two-year-old sat sweetly on the same side of his other siblings and stayed put for the most part and didn’t spill his or everyone else’s beverages all over himself or the entire table. And no one had to be hauled out of the place kicking and screaming. The best part was hearing the kids laughing together – instead of the usual bickering at dinner – and my husband and I sat next to each and could even hear ourselves talk! It was wonderful. Maybe you are wondering what this has to do with Goodness and Kindness and God’s existence. I’m getting there. Well, I have some good news for you. You’re meal has already been paid for. Yeah, someone in the restaurant has already paid for you meal. You’ve been taken care of. No way! We were shocked, confused, humbled, and incredibly grateful. Somewhere, someone in the restaurant had noticed our family. And they either looked at us and all of our four children and took pity. Or – and I’m hoping it was more for this – maybe they saw our family enjoying a nice meal together and this brought them some joy. Whatever the reason, they decided to do something kind. Something that no one else – except their waiters, us, and whoever they chose to tell – would know about. This anonymous person didn’t have to do this. They wouldn’t die if they didn’t. There was no real benefit for their physical health or well being. In other words, they weren’t being kind to us because of some innate instinctual desire to preserve their own lives. They showed us goodness and kindness because they chose to. I get that there is much, much, much suffering in this world. If I didn’t know, all I’d have to do is turn the news on or read about on all the media sites. That’s all they talk about really – the bad, the sin, the greed, the perversion, the insanity. If you want to see something good, you really have to dig around for it. That’s one reason I don’t read the news as much anymore. Life is more enjoyable when you spend time looking for the hidden good instead of all the bad blaring in your face. Goodness – even in the midst of horrible, mind-numbing suffering – exists. And so, therefore, does God. I know that seems like a big jump for people who like to think a lot. But it’s really quite simple. Why would goodness exist if God didn’t? Yeah, yeah, people say it’s because of our will to survive. But again, there are so many examples of people going way out of their way to do good for another, even at their own risk. And I acknowledge people have the ability to show kindness even if they are “good without God.” I daresay there are many atheists who are kinder than many Christians. But where does this goodness and kindness come from? This desire to do good and show kindness to others has to come from a source that is also Good and Kind. I think this could be a very hard concept for someone who has never experienced a good life or for someone who was born into a life virtually devoid of love. But even then, you can see how the lack of goodness and kindness in their live affects them in long-lasting and damaging ways. Which only proves that people need love, they need goodness and kindness in their life. Not just food and water and shelter. People need love. They need to see it, feel it, touch it, have it. 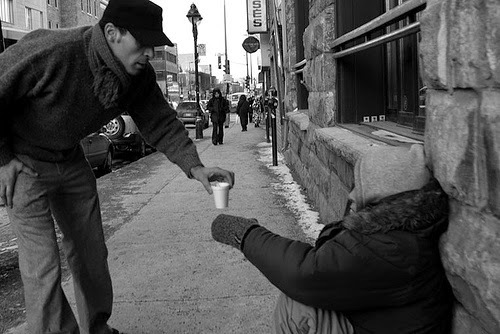 It just takes one small act of simple, no-strings-attached, kindness. Then, a seed is planted. Once you see that seed of good, it brings hope. Hope that there is something outside of the darkness. Something greater and better. Something GOOD. And that something – is God.